Traditional Thai Massage technique is known as the most holistic type of therapy. It combines modern scientific knowledge of anatomy of physiology with the disciplines of traditional oriental medicine. It employs combinations of rhythmic acupressure, body rocking and deep assisted stretches to relieve muscular tension and enables more blood to be carried throughout the body. A number of gentle techniques are carried out on the floor using the feet, knees, elbows, palms, forearms and thumbs. 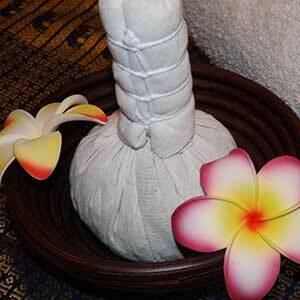 The heated muslin parcel of aromatic, medicinal herbs and spices is a truly heavenly health treatment. It has remained unchanged since Thailand’s (then Siam) Ayutthaya period of the 14th to 18th century. Fragrant hot herb packs were administered to weary soldiers upon their return home to relieve tired and weary bodies and minds. Sink into a beautifully calming and balancing full body massage, designed to relax your mind, body and spirit. Immerse yourself in the restorative experience of totally organic aromatic body oils gently massaged into your body combined with gentle stretching. If you’re feeling in need of abody boost, opt for Gasalongs Revitalisng Body Massage. This deep energising full body massage with organic lemongrass oil, is designed to invigorate your whole body and give you a renewed feeling of health and vitality. A combination of Thai and Swedish massage resulting in a relaxing massage that focuses on easing tight muscles and soothes both body and mind.